Cole: All the hopes you carry, fears you fight. You are theirs. It must be very hard. I hope I help. characters yearning for connection and penance. He's so ordinary at first glance—a skinny kid, nineteen maybe, with straggly blond hair, a wide mouth, a comically broad hat, and pale and darkly shadowed eyes—as if he's seen all the badness the world has to offer and is no longer able to sleep. He speaks poetically, in flowing, alliterative, rhythmic cadences that are almost musical. He doesn't talk about what people say. He talks about what they feel. 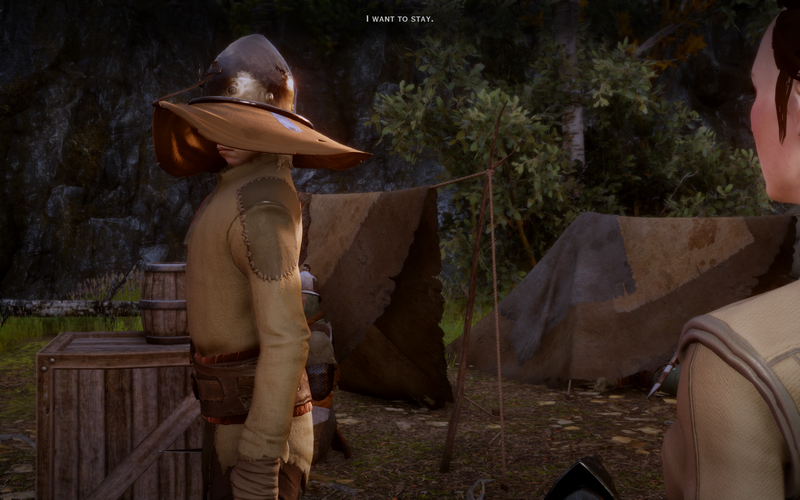 Cole is the strangest of our companions in Dragon Age: Inquisition. 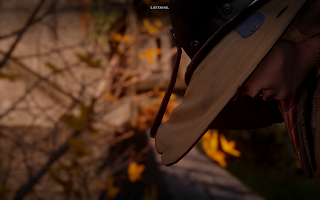 Depending on our choices early on in the game, we either meet him during the quest "Champions of the Just," supporting the Templars, or, if we support the mages, just before the epic attack by Corypheus on Haven. I've played both, and I loved meeting Cole in "Champions of the Just," and getting his help in separating the lies from truths in that quest, with Cole's quiet, kind voice leading us through a web of lies and illusions. However for me the canon playthrough for Cole will always be the mage-supported option, when he arrives at Skyhold carrying poor, annoying, wounded Roderick, crying, "I can't help if you don't open the door!" Just as Bull's true role is giving people what they need, "helping"—wherever and whenever he can—is Cole's core purpose. But just as Bull's caregiving was warped by the Qun, so too was Cole's original desire to help warped, at first, into death and blood. He is a spirit of compassion, a lost boy, and a murderer. A scrap of paper mysteriously notes, "His name is Cole." But nobody can quite remember who wrote it. If you read David Gaider's haunting Dragon Age novel Asunder (essential reading before playing Dragon Age: Inquisition, along with The Stolen Throne, The Calling, and The Masked Empire), you'll learn of the events at the White Spire mage circle, at one point certainly one of the cruelest in Thedas. With abuse of its mages by the Templars set to guard them out of control, the White Spire rivaled the Kirkwall mage circle (Dragon Age II) for cruelty and mistreatment. Cole was a mysterious figure there who seemed to be able to appear and disappear at will, and to cause people to forget his presence. He also creepily, coolly helped mages to their deaths whenever they, threatened with abuse or Tranquility (the creepy magical-emotional-lobotomy of the Dragon Age universe) expressed a wish for death or escape. It's worth noting that the period of time during which Cole was actively murderous (however twistedly he thought he was "helping") is, as Solas noted, strong evidence that he—a pure spirit of Compassion, as we later discover, had been warped and twisted into something apart from himself. of vengeance and retribution against those who hurt others. 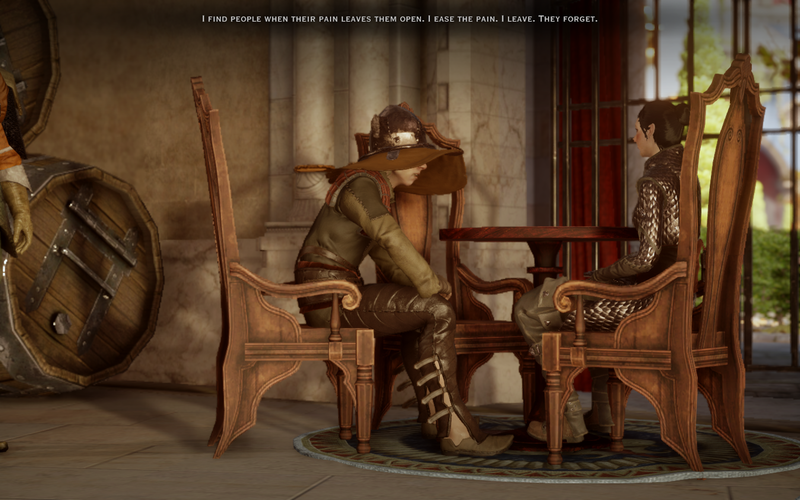 Eventually, however, Cole befriended Rhys, a mage of the circle who was actually the grown illegitimate son of Wynne (a tragic note we almost swoop right past from Dragon Age: Origins—and as we know from Alistair, swooping is the worst thing ever), the product of her long-ago affair with a Templar. Cole teamed up with Rhys and Evangeline, an honorable female Templar warrior, through adventures from the White Spire to Adamant Fortress and the Fade, in order to find justice. I love Rhys and Evangeline for many reasons—as a romance of mage and Templar, they are a Dragon Age echo of Tolkien's Beren and Luthien, of Romeo and Juliet, of Tauriel and Kili (Oh, hush, I cannot hear your Hobbit-movie criticisms, my elf-ears are closed...Tolkien would have adored them), of opposites coming together despite every reason to stay sundered and apart. Meanwhile: Rhys and Evangeline are crucial to Cole's story because they were his first real experiences with love, family and acceptance. Cole supported their efforts to rectify the Circle's evils, even surviving the terrible moment in the Fade when he realized just how much tragedy he himself had willingly forgotten (and that he had, in fact, been a ghost or spirit all along). Unfortunately, their realization of his spirit (and possibly demon) status sundered the friendship, leaving Cole alone and near despair. But Cole survived this devastating scenario, even more coolly and scarily than expected, ensuring that the evil Lord Seeker Lambert would never harm anyone else before Cole left to find his own mysterious path. Left at a crossroads, Cole needed something he wasn't even aware was possible: Help for himself. Then he found the Inquisition, and was drawn away from his lonely shadows once more... and into the light. This is where the torch is passed on the character of Cole, and we follow Cole from the haunted, traumatized boy of the novel Asunder written by Gaider, and into the poetic spirit of compassion written in DAI by Patrick Weekes. While Gaider's Cole was quieter, colder, and lonelier, Weekes's Cole is stranger and sadder, speaking his impressions of the feelings of those around him in a kind of constant, ecstatic lyricism. Yet they are recognizably the same boy, and it's a testament to both writers that Cole manages to still feel consistent and believable between the two, as if Weekes's Cole were simply a raw nerve after awakening from all of the hardship and pain Gaider's Asunder Cole had experienced. While Cole is greeted with fear and distrust by many upon his first appearance to the Inquisition, Solas is able to quiet most concerns with the revelation that Cole is something new—not a demon in the traditional sense, but a spirit (that we eventually learn is one of Compassion or Mercy) who genuinely wants to heal others. Cassandra: Tell that demon...what does it call itself, Cole? Tell it to leave. He may not mean harm, but that does not mean he will not harm us. Spirits are not creatures to take at face value. Be cautious with him, Inquisitor. Sera: Not saying nothing about that. That thing is just wrong. Vivienne (to Solas): You should not encourage that thing. 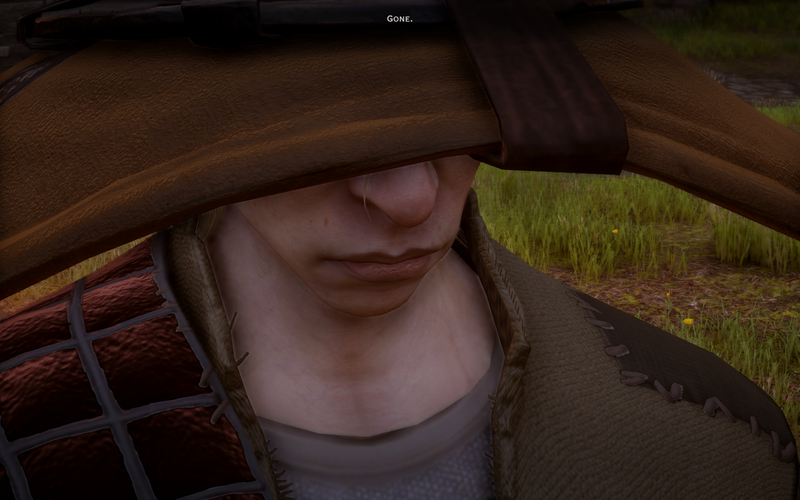 Cole (indignantly): Solas is not a thing. Solas (with subtle humor): Well said. Cole is not an 'it.' But this is a great example of the ways in which his very innocence and, well, density, can sometimes inadvertently be his greatest protections. As when he is touchingly grateful for one of the rare occasions on which Sera refers to him as a "him:"
Sera: Could someone please shut him up? Or I am going to shaft him in his creepy little eyes. Cole (happily): You... you called me him. Thank you! Cassandra: The Inquisitor believes you wish to help, but I will not allow you to threaten innocents. Cole: Yes. Help the hurt, save the small. If I become a demon, cut me down. Cassandra: Do not doubt me. I will do it. Cassandra: You're... serious, aren't you? Cole: Yes. I hope you are, too. Cole (to Blackwall, after the revelations of his deception and criminal past): If you want to remember, remember this: if you become Rainier again, I will be here, and I will kill you. And if I become a demon again and hurt people, you will kill me. Blackwall: I believe I can work with that. 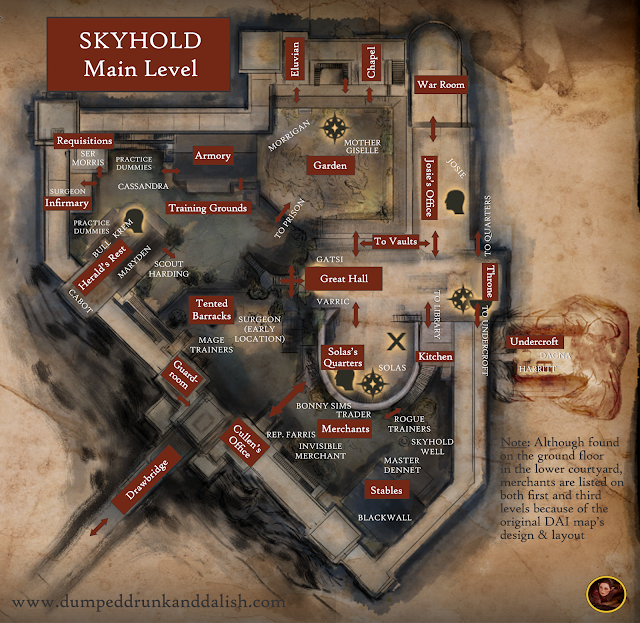 After the quest "Here Lies the Abyss" at Adamant Fortress, Cole will also confront the Inquisitor and, once again, ask us to promise to kill him if he, like the Grey Wardens we witnessed there, proves to be a danger to others. As a side note, it's interesting—if we respond that we will do so, we get a big approval hit. If we don't we'll get a Greatly Disapproves, which is a whopping -20 to Cole's approval. It's one more reminder that Cole does not joke around (as we already know if we've witnessed poor Varric's fruitless attempts to teach Cole the basic elements behind the simplest knock-knock jokes). The paradox of Cole is that, while he keeps his companions' secrets (and they are numerous, troubling, and occasionally terrifying), he nevertheless finds constant ways to reveal their innermost hearts. Cole, a reader of souls and intentions, provides a window into our companions that is unique, profound and fascinating. In other words, if you take him out with you as a party member, you'll get all sorts of insights into the private worlds of your companions (complete with a glimpse into even Vivienne's frosty little bruised heart). If you don't? You're missing out. Iron Bull: Hey, Cole. Quick! What number am I thinking of? Cole: Raw and hot, trying to open it, but just darkness. How bad, how bad? No—done now. No sense worrying. The man they hurt coughs, shaking, but sits up. Eyes wide. No, not a man, a woman, clothes torn. "You're safe now. I'm Iron Bull. What do you want me to call you?" Iron Bull (dryly): Twelve. The number I was thinking of... was "twelve." between the companions and the Inquisitor. Cole: Rilienus, skin tan like fine whiskey, cheekbones shaded, lips curl when he smiles. (pause) He would have said yes. Dorian: I'll... thank you not to do that again, please. We also witness Cassandra's touching memories of childhood companionship (as well as a glimpse of her feelings for lost love Regalyan), and the fact that even spirits across the Veil are consistently impatient for Varric's next books. Amusingly, Cole also divulges some decidedly intimate moments between Bull and a romanced Inquisitor, to the intense discomfort of both, and to the delight of their companions. Another one of Cole's talents isn't just clairvoyance, but that he seems to be able to see across the Fade. I've addressed this in more detail separately here, but these conversations with Solas are delightful, and often provide additional takes on great moments in film or gaming, while also offering hidden insights into the companions we love, as well. Cole is the watcher of the group, the emotional conduit between the companions and the Inquisitor. He's the person who feels intensely, watches those he loves and tries to figure out how to either heal or help them, or what makes them tick. In return, he is given love and acceptance, and the lost boy finds a family. and care for him... and he also gets a family, to boot. It's lovely. That's why I love the evolving nature of most of Cole's banters with his companions, as they show that, overwhelmingly, it's very hard to remain afraid of or hostile toward someone who knows the love and fear within your heart. Cole: The Iron Bull, in one fight, you let someone hit you so they wouldn't hit me. Cole: But you hate demons. Iron Bull: Listen, Cole. You might be a weird, squirrelly kid, but you're my weird, squirrelly kid. Cassandra also evolves from her early suspicions to become teasing and quietly affectionate with Cole (bonding even more closely once she realizes he knew and recognizes her brush with a Faith spirit), and Varric anchors him to the world in a simple way that requires no violence or forgetting. Varric further reminds Cole that Cole can in fact become a real live boy—then (depending on what you choose) he actually helps him do it. Solas, meanwhile, gives Cole the opportunity to voice ideas and conversations he has never been able to share before, transcendent and mysterious and shining from behind the Fade. Basically, Cole goes from orphanhood to having three fathers who all actively love, fear and care for him... and he also gets an extended family, to boot (complete with bratty big sister in Sera, and chilly stepmother in Vivienne). It's lovely and real. Cole: They are not gone so long as you remember them. Cole: But you could let them go. Solas: I know that as well. Cole: You didn't do it to be right. You did it to save them. Inquisitor: Solas, what is Cole talking about? Solas: A mistake. One of many made by a much younger elf who was certain he knew everything. Cole: You weren't wrong, though. Which is why it's so devastating at the end of DAI, when visiting Cole after the defeat of Corypants, when we realize after Solas's departure that he has actually enspelled poor Cole to forget everything he might once have seen in Solas's mind. All those conversations, all those moments of friendship... lost. But that's all in the future. Meanwhile, in one key conversation that I feel sums up their entire friendship, Solas and Cole discuss Cole's uniqueness as a spirit of compassion, especially in such a dark and demon-haunted world. Solas remarks upon how necessary that spirit is, now more than ever, and how precious and rare it is. Cole, pleased but puzzled, responds that he will try not to die. 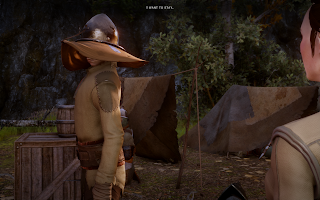 Solas responds quietly and with feeling: "Do that, please." While I was moved and saddened when Cole returned to the Fade in the playthroughs in which I kept him a spirit because it just felt so much like a defeat to me, like a step backward, I kept thinking of Solas's quiet plea to Cole, of that one moment as noted above. And I thought about how that very ending curiously also gives me the most hope for Cole's effect on the next (rumored) chapter of Dragon Age. It ultimately gives me hope that a Fade-returned Cole, like the guardian angels he loved in so many Earth-movies, can now perhaps still manage to reach Solas in ways we can't, and that he can help us to save or redeem him in DA4. There's a beautiful symmetry to the idea: Solas helped Cole in so many ways to understand his heart and to release his guilt and regret. The least Cole can do is to finally help Solas to free and understand his own, before it's too late.